I hadn't been thinking about killing Delwood. ~ Opening of On the Road with Del and Louise. Del’s a small time crook with a moral conscience—robbing convenience stores only for tuition and academic expenses. Brash and sassy Louise goes from being a holdup victim to Del’s lover and accomplice. All they want is a fresh start, an honest life, and a chance to build a family together, but fate conspires to put ever-steeper challenges in their path—and escalating temptations, too. From screwball comedy to domestic drama, and from caper tale to traditional whodunit, these six stories offer suspense with a side of romance—and a little something for all tastes. 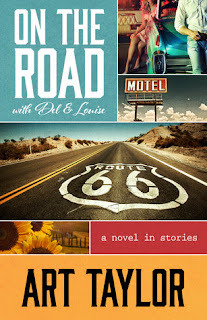 When I first began reading On the Road with Del and Louise, I expected a lighthearted and funny collection of short stories, only loosely tied together. Art Taylor's novel is so much more than that. It's the story of a couple, Del and Louise, who meet, fall in love, face difficult times and must make hard decisions. There is quite a bit of humor mixed in with many more thoughtful moments. I genuinely loved Taylor's writing style. He makes it seem so effortless, drawing out the lives of these two characters on the page, bringing them to life. At the beginning of the novel, I wasn't quite sure I would like Del and Louise: Del robbing a convenience store and Louise handing him her number in the middle of the hold up. And yet, the more the reader gets to know the two, the easier it is to not only see the good in them, but come to love their flaws as well. Del seems to the be the most sensible of the two, while Louise is the dreamer. They are just ordinary people, not particularly the brightest, trying to make their way in the world. The various stories that make up this novel show the characters at different points in their life. We see them grow as they attempt to make a better life for themselves. They are met with many disappointments along the way. From their first meeting, to life on the road, a career in real estate to wine tasting, and reconnecting with family to settling down on their own, I had a great time traveling cross the country, getting caught up in Del and Louise's story. The stories flow well into each other, and the book really does read like a novel, although each of the stories can be read individually. My favorite stories was perhaps the most emotional (to me)--as Del and Louise seem to finally be really settling down. It turns out to be an extremely difficult time for both Del and Louise, one that had me in tears. But then, I especially loved the final story of the collection (which I won't go into detail about because I wouldn't want to spoil it for you), which finds the characters in Louise's hometown trying to solve a mystery. It was both funny and sentimental. It was the perfect ending for this particular book. I already miss Del and Louise wish the book hadn't had to end. On the Road with Del and Louise turned out to be quite a gem, and I am so glad I took a chance on it. I look forward to exploring more of Art Taylor's writing. To learn more about Art Taylor and his work, please visit the author's website. You can also find the author on Goodreads, Facebook, and Twitter. Source: I received this book for an honest review from the publisher via NetGalley. Oh my gosh, what a way to meet someone! You've made me curious about this book! Kathy - It's certainly unique. :-) I hope you do decide to read it, Kathy. Great review, you have certainly sold this one to me. Tracy - I was hoping I would like it, but was surprised at how much. Oh, my goodness! I so much appreciate your kind words on my book. I'm tremendously pleased that you enjoyed it! Art - Thank you so much for your visit and comment. I loved your book, and hope others who read it will too. This is so not what I would've expected just from the glance at the cover. I love the idea of the novel in stories and the sound of the characters. I love when an author makes you like characters that start off as unlikable and makes them come so alive that you miss them! Katherine - This was such a touching and delightful book. I think the cover fits pretty well with the book, but I know what you mean. At first glance you might be expecting something different. I usually don't read short stories but if they flow well into each other I might give it a try. Thanks for the review. Violet - Short stories are hit and miss with me, and so I tend to be picky about the collections I read. I do like the reading connected stories though--and while these can stand alone, they flow well enough into each other that I think even non-short story readers will like this. This sounds like a good read, Wendy! I wouldn't have picked up this book at first glance (must be the cover) but I'm sure glad to have read your review. Me .... again. On a totally unrelated note. I have tried to connect with you on FB. If I have got the right you there is a message but because we are not friends it has been delivered to another file other than your message box. Glad you enjoyed On the Road with Del and Louise. It does sound like a good collection, especially if it brought you to tears. Great post. Great review! I don't think I've heard of this one before but it sounds really good. Iliana - I think might like it if you decide to read it!